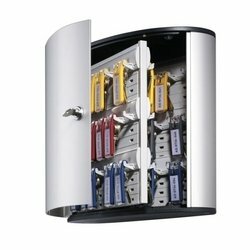 Predrilled key cabinet simplifies key control. key tags store face-out for fast access and have a label window. to insert a label, open the key tag and snap close. each height-adjustable rack holds six key tags and accommodates keys of varying lengths. cabinet door locks with supplied key. key cabinet includes starter set of six key tags in assorted colors, two keys, a key inventory list which mounts to the inside of the panel door and mounting hardware. templates are available online for tag inserts and inventory sheets.